The famous boot-shaped peninsula in Southern Europe is instantly recognizable as Italy - with the boot 'kicking' the island of Sicily, and the island of Sardinia north-west of this. Bounded very effectively by Switzerland and the Alps to the north, the country is surrounded by water for most of its length: except at the top of the boot where it borders France in the west and Slovenia in the east. The Apennine Mountains run the length of the peninsula. The Adriatic Sea borders the East , the Ligurian and Tyrrhenian Seas the West, and the Ionian Sea the south. While the north of the country is more temperate, the south has a Mediterranean climate. Summers are hot and dry, especially in the south. Temperatures range from around 75°F to 81°F in Sardinia and Sicily. Southern winters are mild, while northern ones are milder but wetter. The mountains usually have heavy snowfalls. Second only to Greece, Italy has one of the oldest histories in Europe, the evidence of this shown by ruined temples, medieval castles, classical sculptures and fine Renaissance churches and paintings. Living in England I've got quite used to finding history around the corner - but Italy does it better! A city frozen in time (Pompeii and that little incident with a volcano), a city sinking beneath the waters (Venice), towers with no inclination to be straight (Pisa). Pretty girls, pretty forward men, and pretty dramatic language. Elegance . . . and ice creams. The Arts. Architecture. Superb relics from the past - yes they get tourists of all ages here! Where else could I be thinking of but Italy? This and following pages in this segment cover Venice, Rome and the Tivoli Gardens, Pompeii, Sorrento, Capri and the Amalfi Drive. 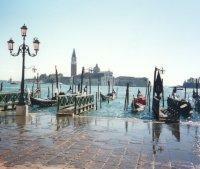 Check out these great pictures of Italy. 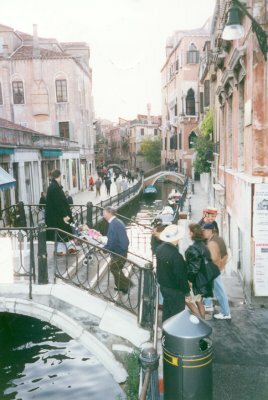 My memories of Venice are dreamlike - as is the place. Everything is different in Venice. After arrival at the airport and being carried across to the terminal building in a stand-up bus about as wide as a building, and after passing through the control points, a short walk takes you to where you get your boat linking with St. Mark's Square. This is quite a long water trip, an eye-opener in itself between many islands, and gradually your impression of Venice as the floating city builds up. Looking across the very wide Grande Canal from St. Mark's Square, it is as if the far buildings really are floating on the shimmering water - especially at night. 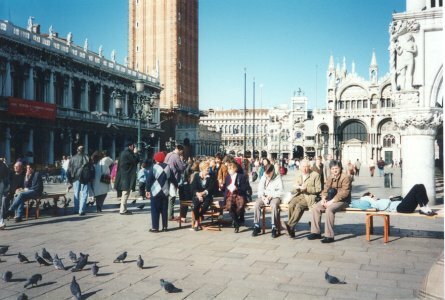 St. Mark's Square is sometimes known as "the most beautiful drawing room in Europe", and here you can sit and slowly drink some of the most expensive cups of coffee in Europe, while listening to sedate music. Or you can buy a snack from one of many nearby cafés and enjoy the architecture for free. I'm not in the guide-book business, so I won't attempt to tell you why you should go into the cathedral or visit the Doge's Palace, or the like. Instead I want to do the usual - give you an 'impression'. The square - really an 'L'-shaped area - gets flooded quite frequently, and there are permanent wooden walkways at hand to get round this problem. As soon as you stray away from this central location, one of the few large open spaces, you are into a warren of streets/alleyways, a virtual maze intersected by frequent narrow canals, some alleys with bridges across the canals and some without. I got a map, quick-sharp, but even with this, navigation was not easy - unless you're good at mazes. Although I'm usually quite good at navigation, I must admit that I met my match in Venice! 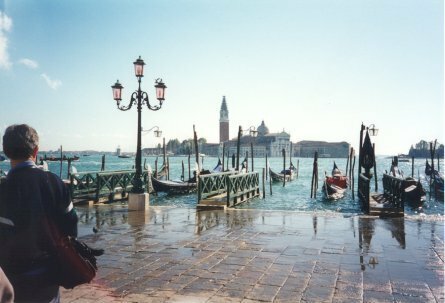 By the way, use the water buses for cheap transport - or the gondolas - if you're really sure you're not a cheapskate! (This will test it out!) 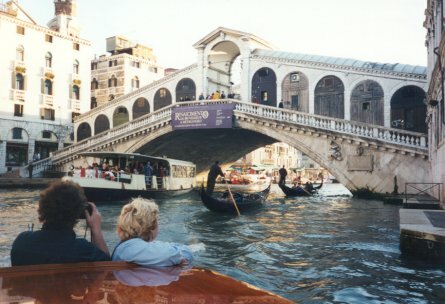 A trip down the Grande Canal from St. Mark's Square to the Rialto Bridge is something not to be missed. Here is where to find the heart of the shopping district and the noisy market. In the fish market you may well discover sea creatures that you've never encountered before - and possibly will never want to encounter again! Whatever you do, make sure that you wander down some of smaller streets in Venice and experience some of the smaller canals and their tiny bridges. Walking these streets is truly walking a maze. Such streets give you a more accurate impression of what the city is really like, and you will not fail to be impressed/depressed about the state of disrepair to be found in some areas. With luck you might see some maintenance going on - from boats! Then consider the difficulty in doing any job when a building is standing in water, and remember the water is ever rising - actually the buildings are ever sinking (possibly both with global warming taken into consideration) - and you can see why some owners don't always care too much! 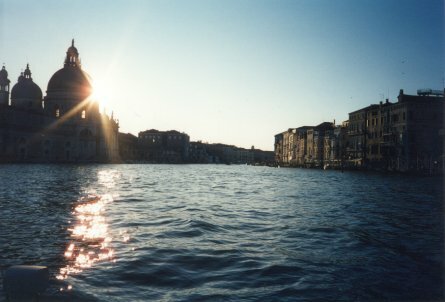 Sunset across the Grande Canal was a memorable sight - especially as the sun sank behind a gleaming dome. But the return trip across the water to the airport in the dark was just a little hair-raising! There are all these substantial looking poles sticking up out of the water, you see. Channel markers, I guess. 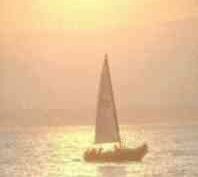 But they had no lights on them, and even our speeding vessel didn't seem to have any lights. Maybe I was wrong - I do hope I was wrong - but it all seemed a bit 'hit and miss' - if you know what I mean! One impression I came away with was that I felt quite a lot safer in Venice than I do in most other European cities or towns. Even at night. There were no louts, no intimidating gangs. All the Italians dressed in style, even the young set, and it was a privilege to walk amongst them in such a beautiful place. (Anyone scruffy was a tourist.) Such a pity it is all 'sinking'. And such a pity it can all get 'stinking' if you go when it's hot! But whenever, whatever, I can recommend Venice. Personally I found it to be the most memorable city I have ever visited. Do try to get a reasonable time there. Such a pity that so many tours only give you half a day! And if you do only get allocated part of a day, do be careful about straying too far and getting lost! If you enjoyed reading the above article then you will probably also enjoy London by Ed, and Northern Cyprus, also in Europe, and our latest articles covering the Orinoco Delta, La Mata, Marbella and Beijing.